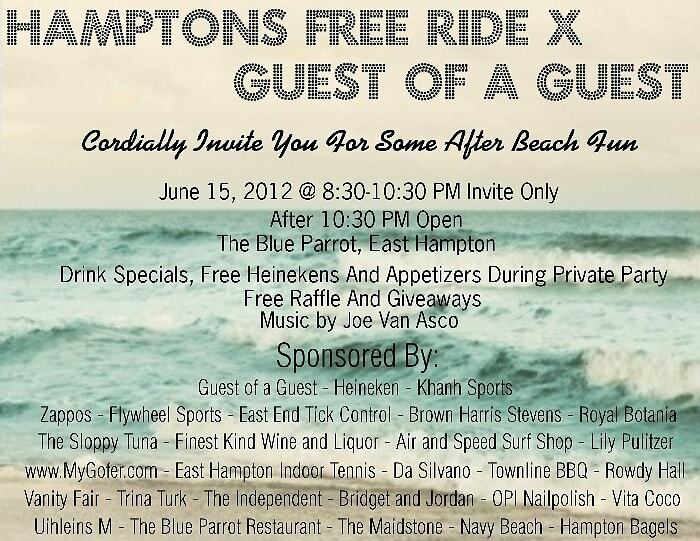 Win 2 VIP Tickets To The Hamptons Free Ride And GofG Party At The Blue Parrot! Follow us on Twitter and win a prize! From 8:30 - 10:30 PM we will be co-hosting a private party with free drinks and appetizers, along with a free raffle and giveaways, and live music by Joe Van Asco. We will also have a photographer there documenting every fun minute so you can tag yourself in our gallery afterwards! Want to come join us? It's easy. @gofghamptons @HamptnsFreeRide I love free stuff! We will randomly select a winner on Thursday evening, so the more you tweet, the more likely you will be chosen! Happy Tweeting! After 10:30 PM, the party will open its doors for everyone to join the fun, so if you don't win, come by for the later party! See you there!